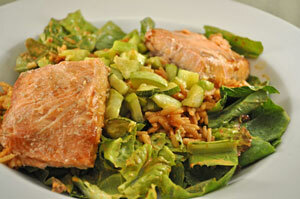 Salad of Roasted Salmon, Thyme for Cooking easy gourmet dinner. This will be the last lettuce salad of the season. You can either bake the salmon or cook it on the barbecue as we did. Mon mari always chooses the barbecue.... An easy, summer dinner to end the week! We use about half of the dressing with this salad; the rest on Sunday.